Earlier today I posted that Microsoft had released a preview of their Office apps for Android Phone today. The new Word, Excel and PowerPoint apps are stand alone individual apps that are far superior to the old Office Mobile and are in line with the path that the company is making for Office across all device platforms. I’ve spent a fair amount of time today with each of them and wanted to provide some quick feedback on them to everyone who is on the fence about downloading them. First I’m going to take a look at Word for Android Phone and I’ll post similar quick looks for Excel and PowerPoint later on in the week. Word for Android Phone is really impressive and if you have used it on your Android tablet you are going to find the experience very similar – exactly what Microsoft is trying to achieve. Within the app you can create and edit documents on devices with screens 10.1″ or smaller but to get all the benefits of it, you really need an Office 365 account. An Office 365 Personal account is $69.99 and available from the Microsoft Store or you can go with Office 365 Home where you can install the Office apps on up to 5 PCs or Macs along with mobile devices. page or any number of other options. Once your template is selected, you can start editing it with your own content. Editing in the app is easy. Just tap where you want to start typing and your keyboard will be displayed. 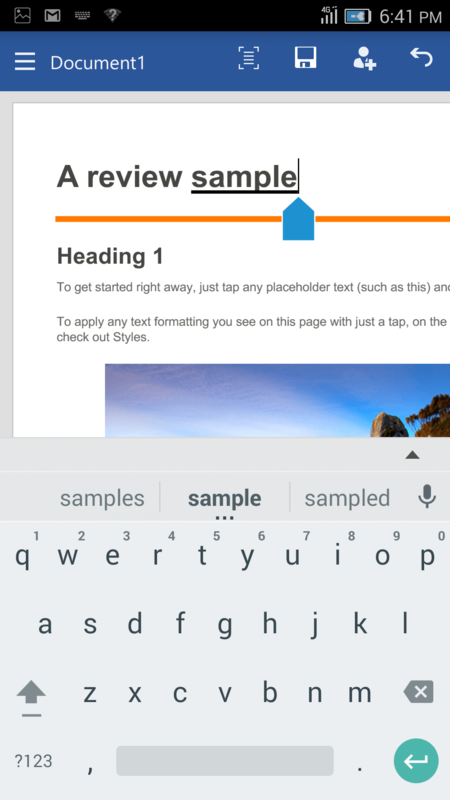 If there is one thing I wish Word for Android Phone did it is support landscape typing. With devices 5″ or larger like my BLU VIVO IV, thumb typing in landscape mode is really convenient. Hopefully that’s something that will be coming in a later build but for now, it’s portrait only. Like Word on your PC, Mac or tablet, you can also edit the fonts, their colors and typeface (bold, italic, underline) using the ribbon located at the bottom of the display. Tap the small carrot in the lower right corner just above the keyboard to expose the ribbon. There you can also enter in bullet paragraphs, superscript, subscript, change paragraph spacing and justification and styles of text (headings, etc) all from the ribbon. Just tap what you want to add or change in your document on the ribbon to make those changes or chose options related to that change (such as font color). You also have the ability to add more advanced things like Headers & Footers, Page Numbers, Footnotes and Endnotes. 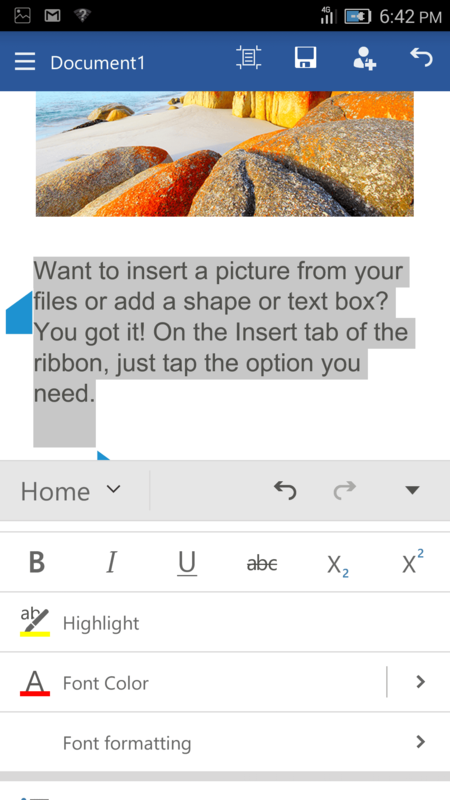 Word for Android Phone certainly does not have the full complement of editing features that you would find on Word for you PC or Mac. However, for on-the-go editing, it is hard to knock it. All the major features are there so even if you are creating a document from scratch, you can get pretty creative with it. The app also supports photo embedding into documents and you can do a lot of manipulation of those photos in your documents. 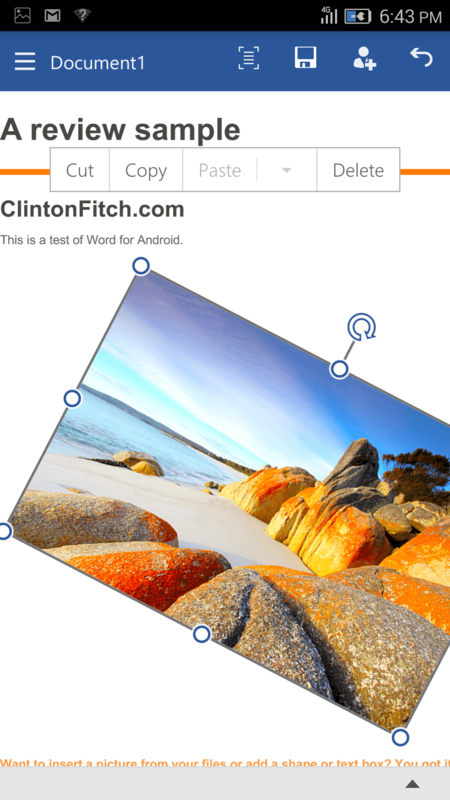 By tapping on the photo in your document, you can resize it as well as rotate it a full 360-degrees. You don’t have the ability to do more advanced things like drop shadows or the like but again, for doing document editing with photos on your Android Phone, it’s not bad. wish Google themselves would step up to the plate on this same mentality as I outlined in my post on the one-sided relationship between the companies. Still, as a user, it’s good that at least one company, Microsoft, is playing nice in the digital sandbox. Finally, a word on stability. As I put in my original post this morning, Word for Android Phone (along with Excel and PowerPoint) are in preview mode (beta). There are some things that don’t work in the app just yet but they will be coming as the preview is updated. But, that said, stability wise, I’ve had no issues. I’ve been working off-and-on with Word this afternoon and have not had one crash or other weird behavior. It is responsive and I found it had no problem keeping up with my typing which, admittedly, is also dependent on the horsepower of your Android Phone. While I also caution on beta software, I don’t have much concern recommending readers to sign up for the preview and give it a try. Once you join the community, Become a tester by clicking the links to the Word,Excel andPowerPoint. If you have the Office for Android Tablets installed on your Android Tablet, after you join the Office Community and become a tester, you can go to the Play Store then navigate to My Apps and find the Office apps there. If you have signed up you should now be able to install them on your Android Phone.